Summer is absolutely glorious in Breckenridge. Golden sunlight, brilliant blue skies, clean mountain air, and breathtaking scenery. 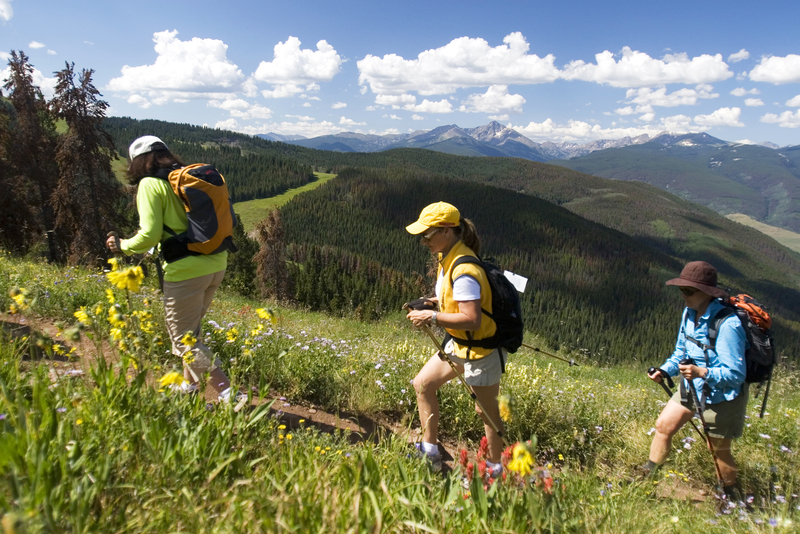 Hikers particularly revel in the long summer days, using them to hike the miles of mountain trails that surround the quaint Victorian town of Breckenridge. Hikers can hop a chair lift at the base of peaks and ride up the mountain to the trail of their choice. Bikers can do the same by putting their bikes on the back of the chair. There are trails for all skill levels, so it’s a great family activity, or a challenging adventure for the serious hiker or biker. A couple of the favorite easy trails accessible at the base of the mountains include Burro Trail at the base of Peak 9 and Sawmill Trail accessed at the Snowflake Lift. There are other hikes where streams and lakes are within view, and always the surrounding beauty of the Rocky Mountains. The three must have for hikers and bikers include water, food for energy, and clothing layers to use as needed. Another item to note is that often the mid-afternoon thunderstorms can roll in for a brief time, so it is important to time your adventures accordingly. There are numerous other summer activities to make Breckenridge the summer retreat location that keeps people returning again and again. As a matter of fact, all it takes is one visit in Breckenridge to fall in love. It is not only the perfect vacation destination, but the perfect all season town that is ideal for a second home. Breckenridge fractional real estate ownership is the perfect solution to have a second home in Breckenridge at a fraction of the cost of whole home ownership, and with more amenities than most luxury homes will ever include. The limited offering of luxury fractional real estate at The Grand Colorado on Peak 8 is destined to quickly become the most desirable and exclusive address in Breckenridge. Featuring mountain modern studio to four bedroom condos, ski in/ski out access and stunning slopeside views of Peak 8 plus five-star resort amenities, fractional real estate ownership paves the way to own your own Breckenridge real estate that you can return home to over and over again. Please be sure to check out our featured properties by CLICKING HERE. For a complimentary owner’s kit on all that The Grand Colorado on Peak 8 has to offer, simply fill out the convenient form below or call Brent Henry, Senior Broker, at 970-485-2117. This entry was posted on June 20, 2015 by elevatemarketingaz. It was filed under Breckenridge, Colorado Real Estate, Fractional Ownership Real Estate Summit County Colorado, Luxury Fractional Real Estate Breckenridge Colorado, Ski In, Ski Out Luxury Condo Breckenridge Colorado, The Grand Colorado on Peak 8 and was tagged with Breckenridge Colorado, Breckenridge Colorado condos, Breckenridge luxury condo sales, Breckenridge real estate, Brent Henry Breckenridge real estate broker, Grand Colorado on Peak Eight, ski out real estate breckenridge colorado, ski_in_ski_out Breckenridge condo.